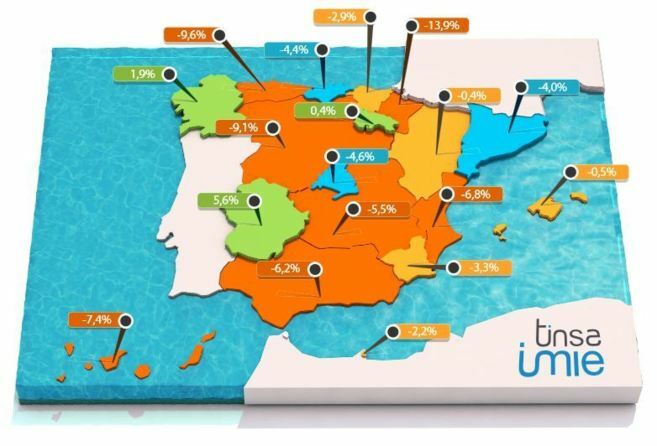 Spanish house prices are still falling in most places around the country, according to the latest local house price index, published quarterly by the appraisal company Tinsa. The index for the third quarter of the year shows that prices were up in six provincial capitals, nine provinces, and three autonomous communities, but fell everywhere else. The average national house price kept falling as a result, down 4.3% compared to the same period last year. The cumulative fall in Spanish house prices since the boom topped out in Q3 2007 is now 40.3%, according to Tinsa’s valuations. That’s the first time the peak-to-trough fall has broken through the 40% barrier. By provincial capitals, prices rose last quarter by 3.8% in Teruel, 2.1% in Zaragoza, 1.7% in Malaga (home to the Costa del Sol), 1.6% in Pontevedra, 0.6% in Cáceres, and 0.1% in Barcelona. At the other end of the scale prices crashed by 16% in Salamanca and 15% in Segovia, both in the region of Castilla y Leon. House prices in the Spanish capital Madrid fell an annualised 2%, which means a peak-to-trough decline of 48.7%. Not as bad as Barcelona province though, where prices are down 51.2% in total. The record for cumulative declines goes to Guadalajar, down 59.4%, , followed by Zaragoza (-54.4%), and Valencia (-53.2%). So in some parts of Spain at least, house prices have more than halved since boom turned to bust. Looking forward Tinsa see the end of house prices declines in Spain around the corner. “We estimate that at the end of 2014 the fall in the average national house price will be close to zero,” say Tinsa.